So, the graduation ceremony. I quite like opportunities like this, to get dressed up and celebrate time well spent with people you’ve met along the way. We all got presented with official-looking folders – in a slight anti-climax, the actual diplomas were in our mailboxes back at the CIE. The American and Australian consuls-general, and Prof. Scott all gave excellent speeches. Actually, the American guy spent a little too long talking about the glamorous life in the consular service, but made up for it with an interesting aside about having to sit next to the repesentative from Burma at some event. I mean, what do you do in that kind of situation? Afterwards, we wandered over to the dining hall for the lunch. On the way, I discussed the possibility of there being booze at this event. My words paraphrased: “I don’t think there will be, but I want to believe in it anyway. It’s the beautiful lie that sustains me in the desert.” And to think I was stone cold sober at the time. We got there, and pretty much my first act was to clear an Asahi bottle off the table and pour myself a glass of ice-cold beer. I was filled with end-of-year goodwill. People I disliked no longer seemed so bad. In fact, I couldn’t even remember the reason for my misanthropy. I cleared a year’s worth of bad blood in a matter of hours, overwhelmingly happy at all these people. I gave my email address out ot everyone who asked, and a few people who didn’t. I carried on drinking (in case you hadn’t guessed). I lost my friends, wandered around, found some more friends, made a quick run to the convenience store across the road, and said my goodbyes to Kansai Gaidai by necking a beer in front of the CIE. 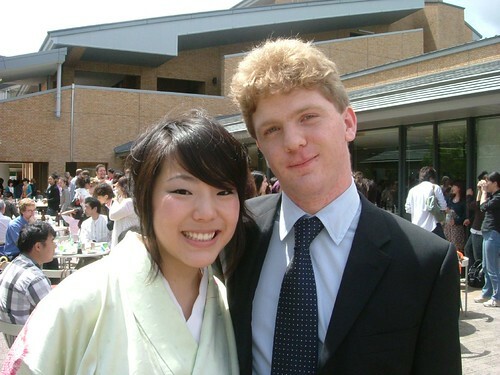 I met a guy from my Japanese class out there, who told me about my “reputation”: “Dude, they say you go home with a different girl every night!” Well, well. That was a pleasant surprise, although I kind of wish I’d heard about it earlier. Maybe if I’d played on that reputation a little, I’d actually be with a girl right now, instead of drunkenly typing this alone at two in the morning. But I digress. photos are now up on Flickr. Relive my journey into inebriation, in photo-essay format. Peace out. UPDATE: For any Caucasians who might be interested, see this pic for the way to properly wear a kimono (ie. be very attractive).